We have certainly been known to play quite a few cooperative games in our house. We enjoy working together with our kids towards a common goal, and having the freedom to talk openly about plans and strategy. I’ve always thought that cooperative games make for the perfect introduction to gaming, but we’ve also reached a stage in our son’s life where he’s ready to challenge us head-to-head every once in a while. Our son is 6-years-old and he has a good amount of experience playing board games now - so he’s capable of much more decision making than beginner board games require. But he’s obviously still unprepared for the more complicated strategy games made for adults that have too many rules and mechanics to remember. So what we're really collecting now are games that kind of bridge that gap by introducing strategy and decision making in a bite-size, family-friendly format. The good news is that with the rise of popularity in board games, there is now a vast quantity of quality games that bridge the gap between Candy Land and Settlers of Catan. In fact, we even wrote an article about our favorite “junior” board games - simplified versions of popular board games that are absolutely perfect for families. Very recently we added a new game to that list of family board games that perfectly fit our needs. Its name is Honga and it’s published by HABA and designed by Günter Burkhardt. Honga is actually recommended for ages 8+, but it turns out that it’s the perfect level of difficulty for our son right now. It’s a fantastic introduction to the concept of resource management - where you gather up resources and decide how to spend them. And gone are the days of doing the same monotonous thing on your turn every single time. In Honga, kids will have to weigh the benefits of a multitude of possibilities on their turn. It’s time to put our strategy hats on, kids. You win Honga by scoring a certain number of points, but there are a few ways to earn those points. And, in the meantime, you’re gathering resources like fish and mushrooms and deciding how to spend them. You can purchase items with those resources from the bartering shop. But you can also earn points by climbing the mountain to pay homage to the nature gods. The fact that there are multiple ways to earn the points needed to win is definitely a great way to keep the game unpredictable and fun. You draw an action card each turn that is covered with little hands that we call “action hands”. You place down your card and point the little hands towards the things you want to do on your turn. If you point 2 little hands towards the fish you gather 2 fish. If you point them towards the mountain you climb 2 steps. If you point them towards the bartering store you can purchase up to 2 items with your resources - and so on. It’s fascinating to watch our little guy figure out games like this and settle on his strategy. 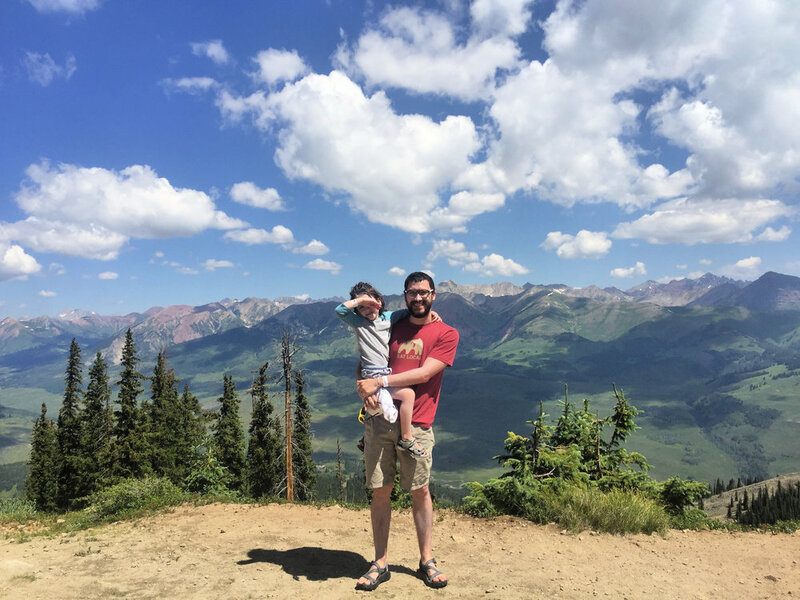 At first, he very quickly focused his attention on climbing the mountain over and over again to pay homage to the nature gods. But it didn’t take long for him to realize he really needed to start collecting some resources and purchasing items as well. After that he became obsessed with capturing mammoths for awhile. And over time he’ll figure out how to balance all of these options at once. There’s definitely a very interesting and engaging mechanic in this game - the titular Honga. Honga is a saber-toothed tiger that you can’t neglect. If you don’t use one of your “action hands” on Honga, he comes over to you and starts gobbling up your food each turn until you get rid of him. 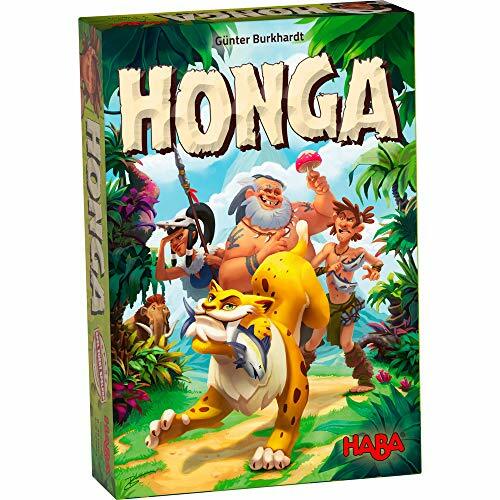 It’s a blast to goof around with the kids and use the Honga game piece to gobble up food. And it’s a pretty fun name to shout out throughout the game as well. A big part of the enjoyment for me in games like this is diving right in and discovering the best strategy while you play. But to be completely honest, it took me a while to understand what the big deal was with this saber-toothed tiger I had to pay attention to. Strategically speaking, I couldn’t figure it out. It seemed like it was easy to just “pay attention” to him every turn. All of us always spent one of our “action hands” on Honga, and he never came to eat any of our food. I began to wonder if we were going to go through an entire game without Honga bothering anybody. So I decided to experiment, and I purposefully didn’t pay attention to him. Honga came and ate one of my fish. And I even let him hang out for a while, eating another fish each turn. Only then did I discover how freeing it was to spend all of my actions on other things. Honga’s not the boss of me - I do what I want. At this point, I’m usually more than happy to have Honga hang out in my village. I’m sure this will come as no surprise to you, but the wooden components in this board game are the same great quality we’ve come to expect from HABA. The high-quality wooden game pieces that come with HABA games will never get old to me. Inside the box you’ll find the saber-toothed tiger, a fire pit, a mammoth tusk, several colorful mammoths, and more. As always, the game pieces from HABA are great enough to just take out of the box and use for free imaginative play. Speaking of free play, our son has a hilarious and awesome habit of making up his own rules for board games, and Honga was no exception. He drew a picture of an alien and his spaceship, and placed it at the top of the mountain. When a caveman reaches the top of the mountain to pray to the nature gods, he’ll discover that the nature gods were in fact aliens, and he’ll receive the flying saucer card. This card can then be used to abduct a mammoth from any player. Out of the mouths of 6-year-olds, am I right? Honga is definitely a winner. It’s a fantastic and engaging prehistoric theme with beautiful components. It has a wonderful, original mechanic where I get to pretend that I’m feeding my pet saber-toothed tiger. It’s a family game that is the perfect step up in challenge for our son. But it’s also so well-designed and so fun that we’ll bring it to an adults only game night as well. HABA absolutely blew it out of the water with some of our favorite introductory board games for toddlers - it’s only fitting for our family to take the next step up in strategy with them as well. Have you played Honga yet? What’s your favorite family board game that sits in that perfect middle ground between being too simple and being too difficult? What’s the first game that really introduced your kids to strategy and decision making? Let us know in the comments!